That said, there are just as many disadvantages. 4. 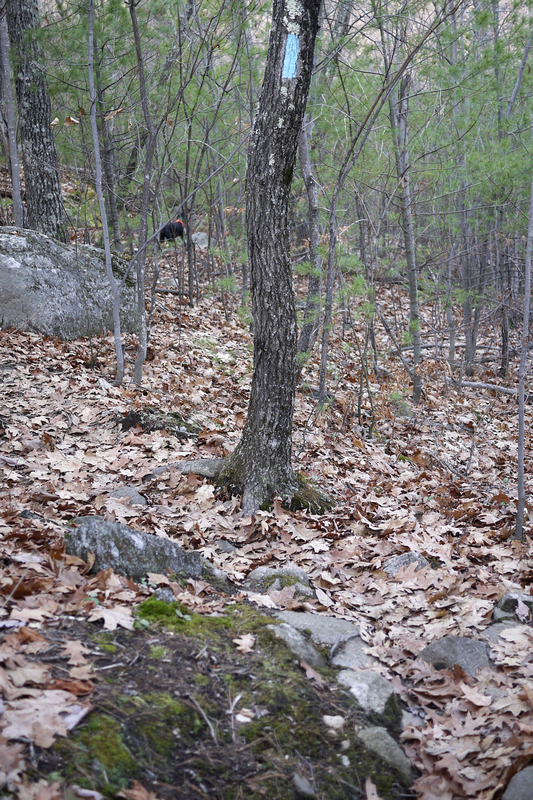 The fallen leaves obscure rocks, water, mud, and uneven ground. Although we had lots of fun, the actual hike was less than spectacular. There was a grey cast to the sky (shortly after the end of the hike, it started raining), and the haze meant I wouldn’t be getting any amazing pictures that day. Still, it was good to get out in the fresh air, and it beats stair climbing in a gym any day! 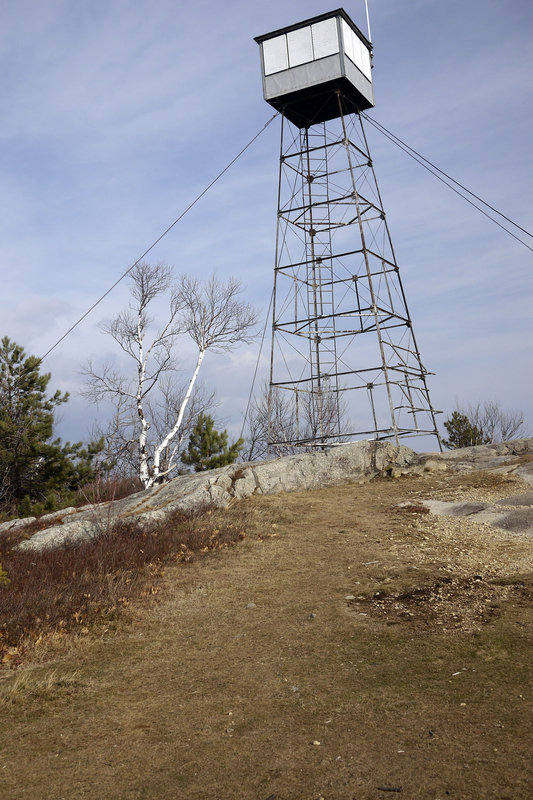 There are many different trails to reach the summit of Pleasant Mountain, which is only 2006' high. 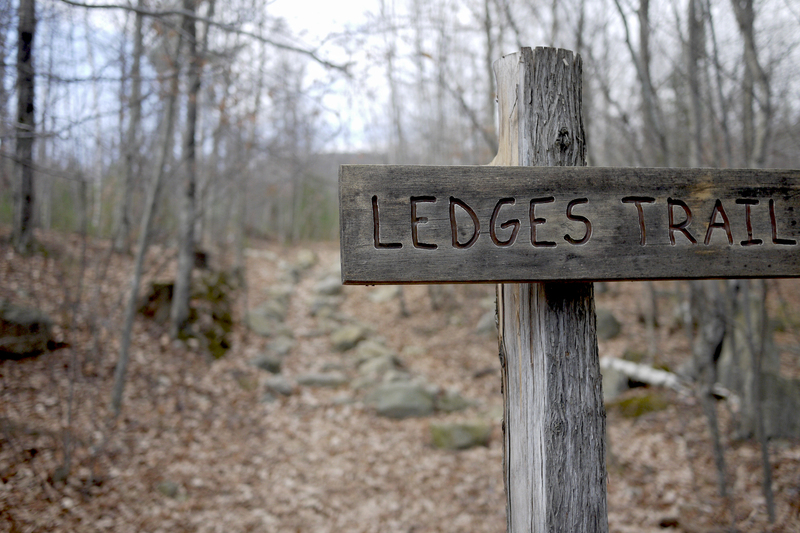 We took the Ledges Trail, which rises about 1800' in less than two miles - not particularly difficult. 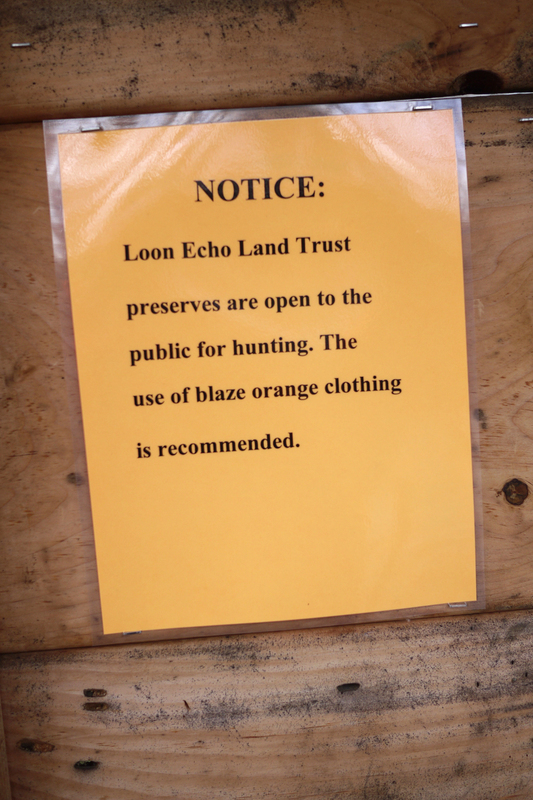 This sign reminds hikers to wear bright orange so that hunters won't mistake hikers for prey. 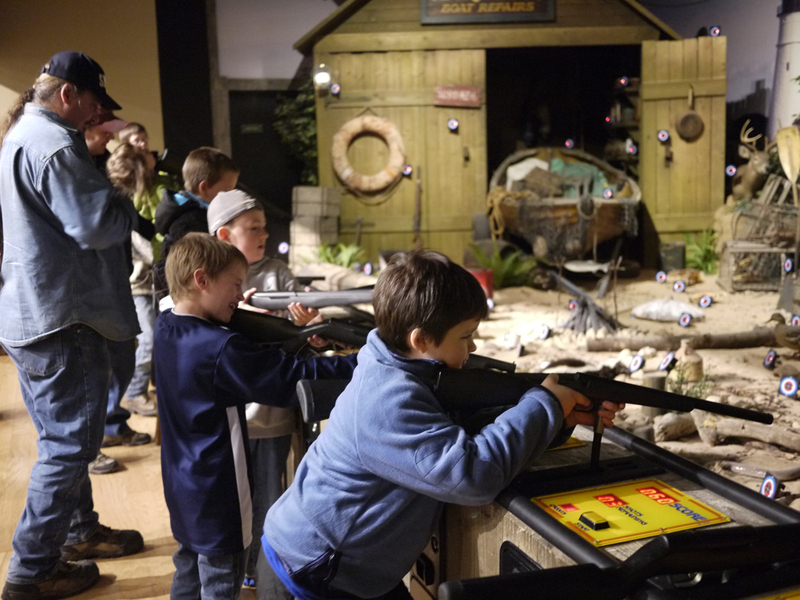 Officially there is no hunting on Sundays in Maine, but there are more lawbreakers than there are game wardens, and we prefer to be safe rather than sorry! If not for the blue blaze trailmarker painted on the tree, we would have wandered off the trail that was hidden by heavy leaf cover. It's very easy to get lost on late aurumn hikes due to faded or sparsely posted trail signs. 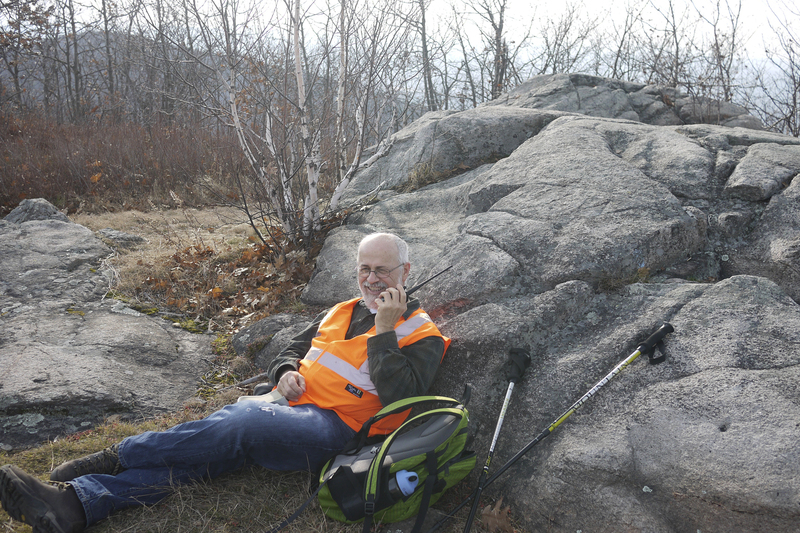 Taking a rest on the summit, my husband chats on his ham radio with other "hams" transmitting from Maine and New Mexico. 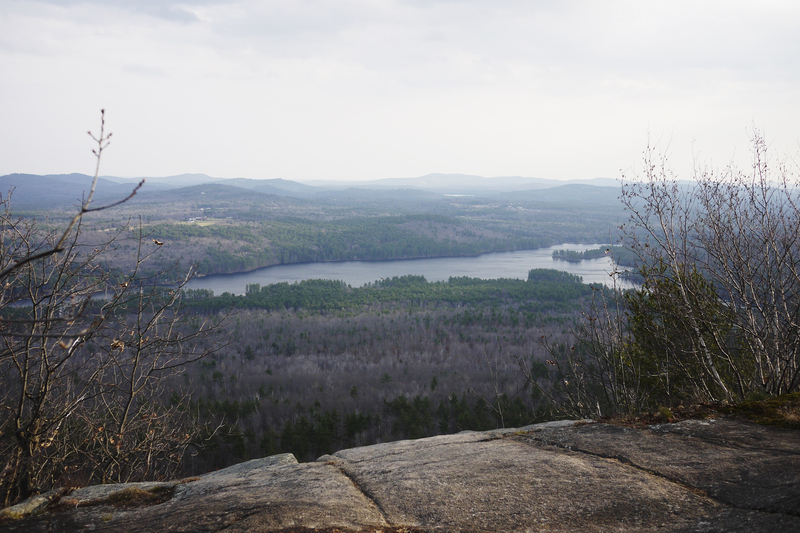 If you’d like to read more about Pleasant Mountain/Shawnee Peak and access an excellent trail map, click here. The lush greens of summer and the vibrant golds, reds, oranges and purples of autumn are long gone. 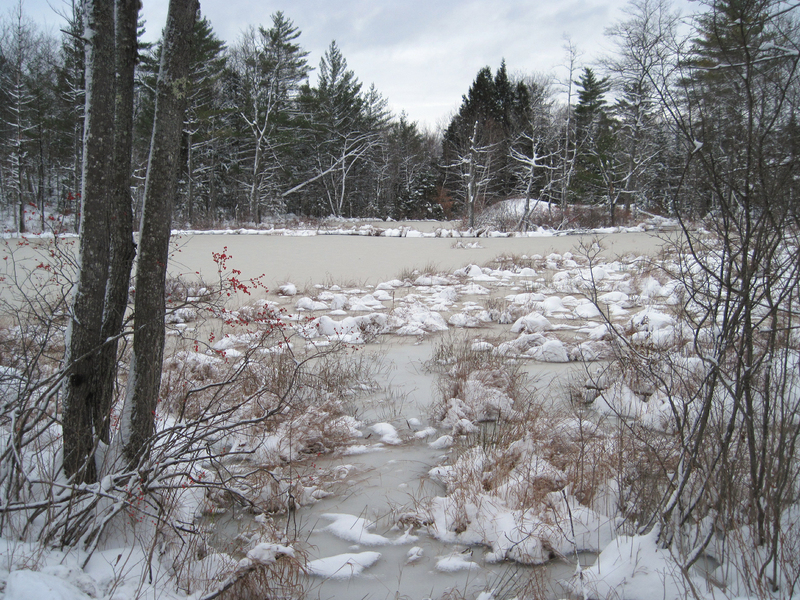 While winter landscapes are often bleak and stark, they have a beauty all their own. Who knew that there were so many shades of grey? Yesterday it was in the 50s, with crystal clear blue, sunny skies. 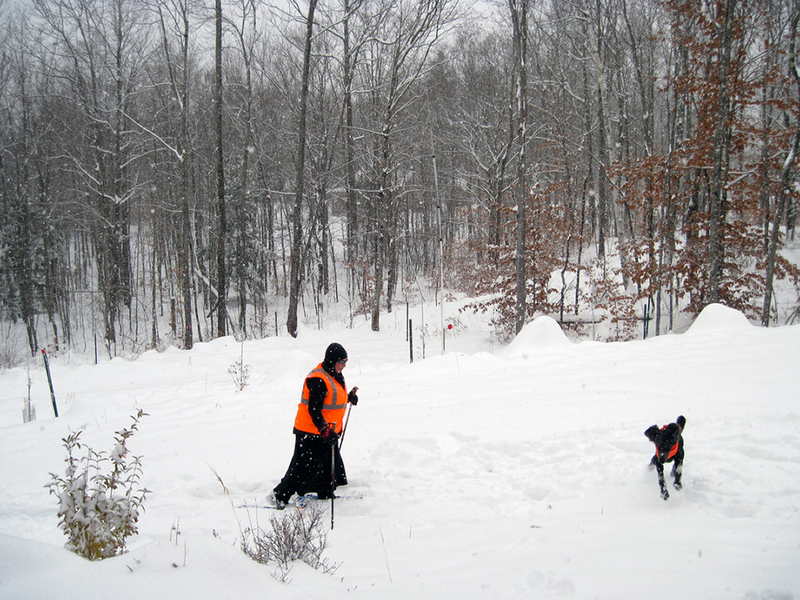 This morning we woke up to heavy snowfall – 10″ as of this writing, with more expected later this afternoon. 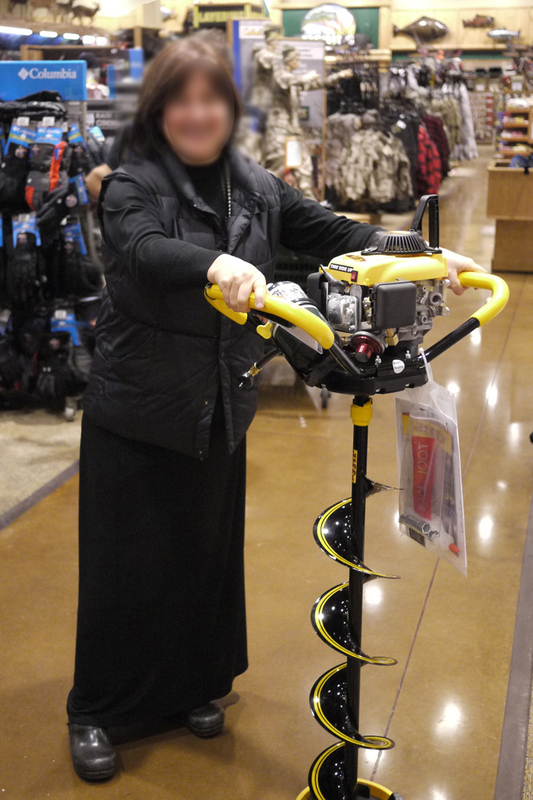 Fortunately, I had just bought some lined, waterproof snow pants for my husband and myself at the bargain price of $10 each. They sure came in handy today! 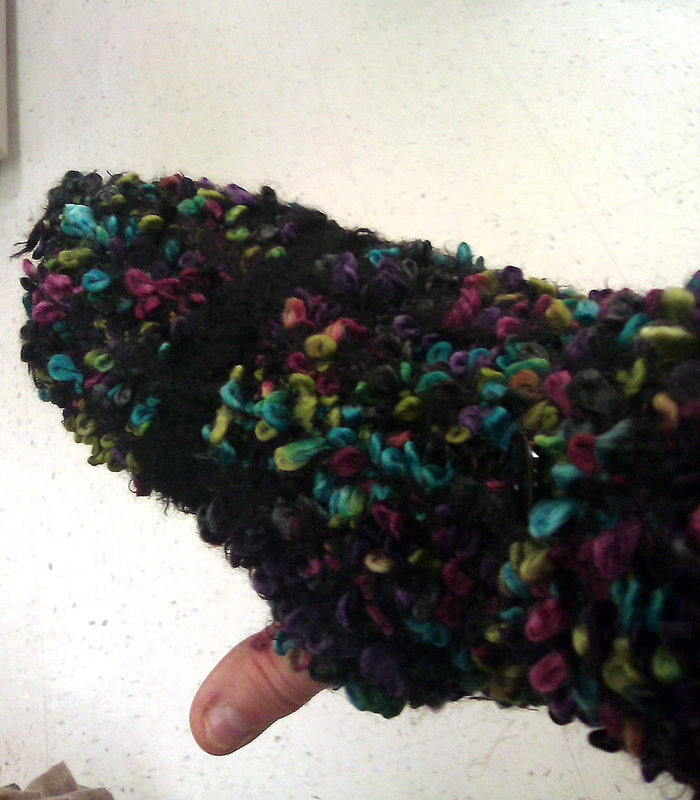 While shopping at the TJ Maxx located in North Conway, NH in the White Mountains, I came across strange-looking winter mittens: a hole where the thumb should be. 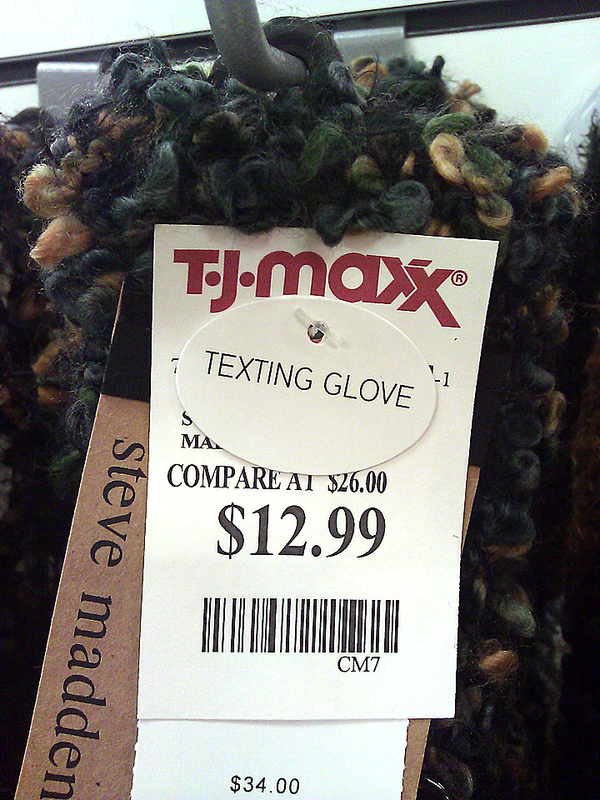 I thought it was a defective pair until I looked at the label. 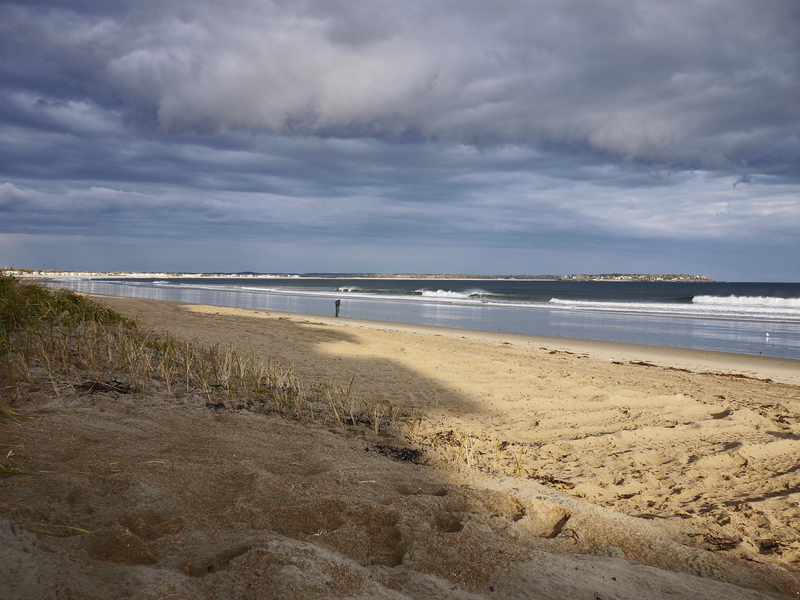 A Shabbaton was held Parshat Va’yera (Veteran’s Day weekend) in Old Orchard Beach, a 7-mile stretch of beautiful sand and ocean along Maine’s southern coast, and my husband and I were excited to attend. 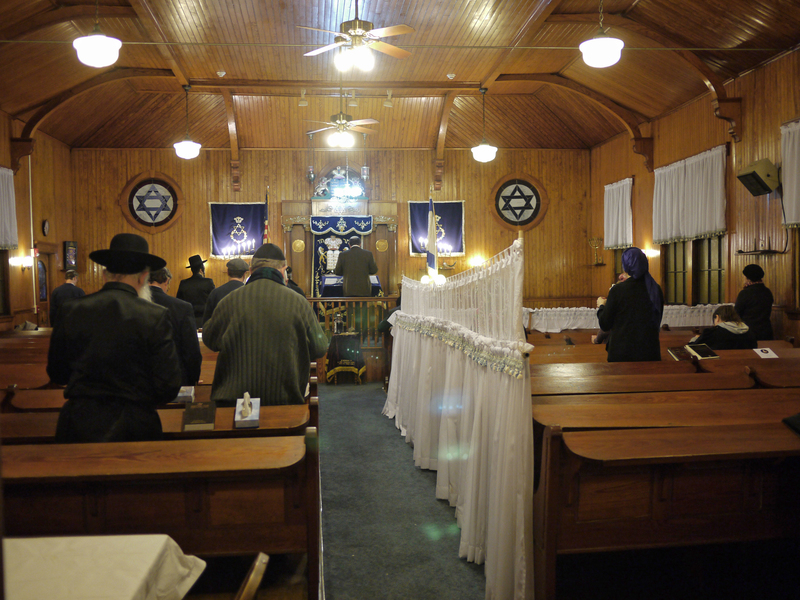 For one thing, my husband doesn’t get that many opportunities to daven with a minyan. It’s always nice to meet new people from different Jewish communities. And as part of the Maine contingent, we felt a responsibility and desire to participate since frum Maine Jews are so few and far in between. 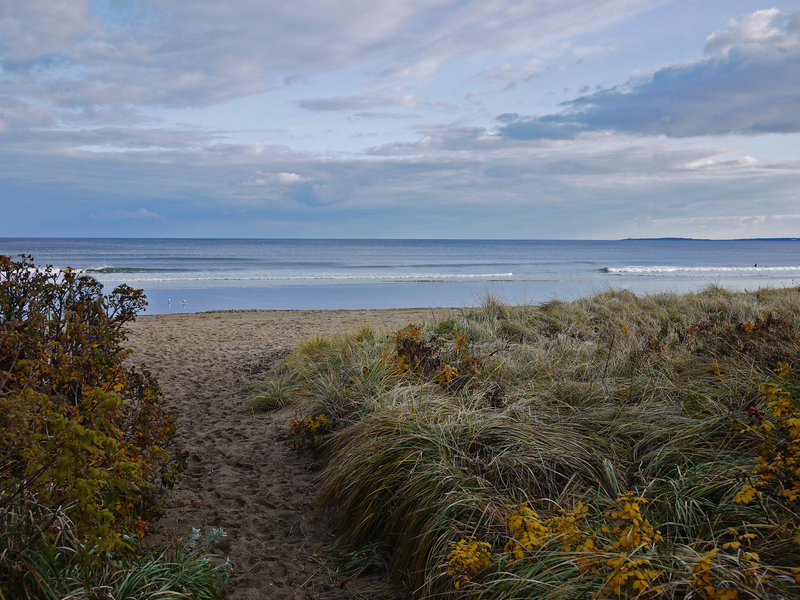 We had been Shabbos guests in Old Orchard Beach in September (you may read about the town’s Jewish history in a previous blogpost by clicking here) and were looking forward to returning. 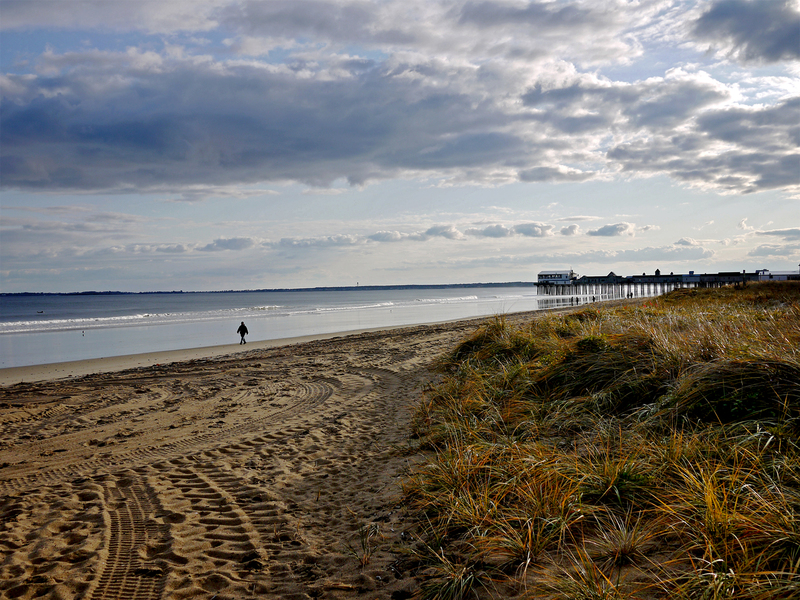 Jewishly speaking, Old Orchard Beach was in its heyday until the 1960s, although they still get a small summer crowd and do have a summer minyan. 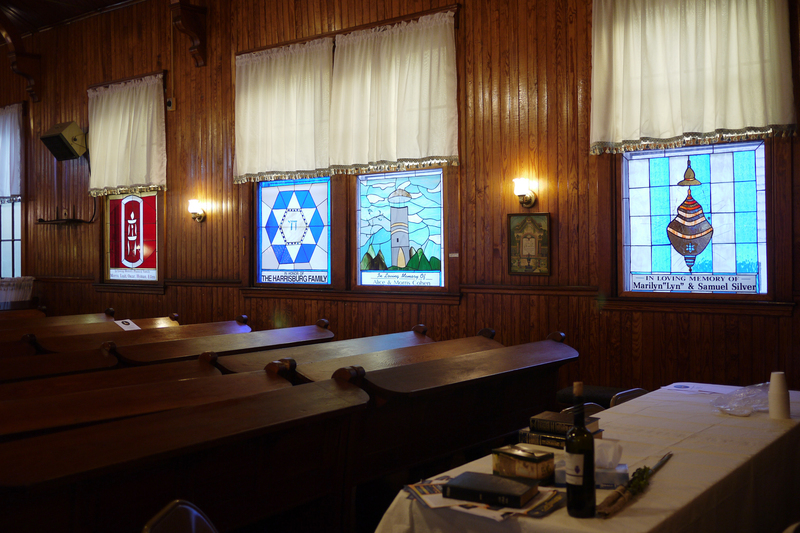 Congregation Beth Israel is a magnificent but small-sized jewel of a shul built in 1912, supposedly by a Jewish community member who was also a boat-builder, and that influence is apparent in its interior architecture and design. 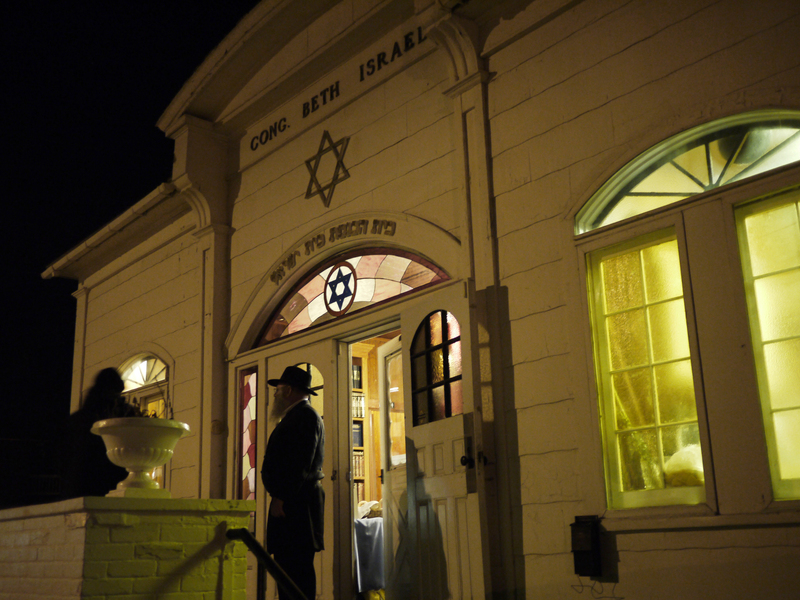 It has always been an Orthodox synagogue since its founding. Unfortunately, to my knowledge, there are no young people with small children who are members, so its future in the next 20 years is uncertain. 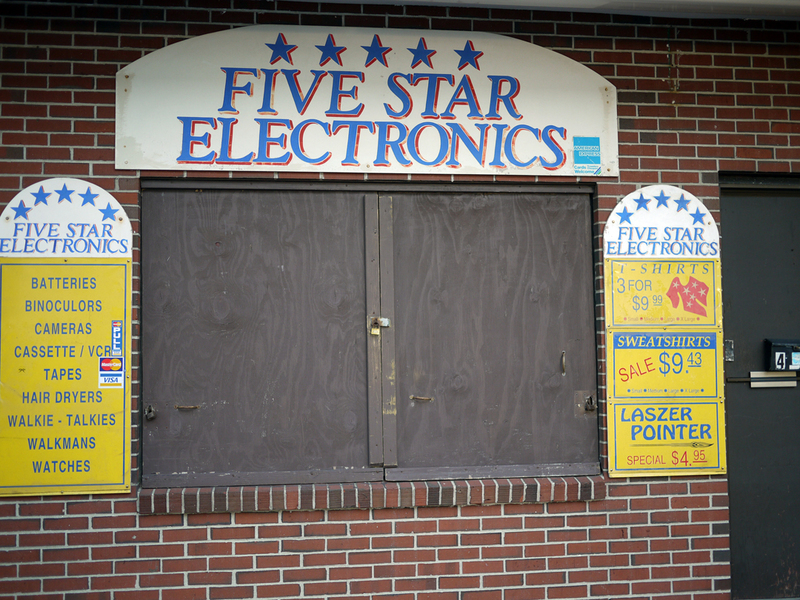 There is a sizeable contingent of traditional Sephardi Israelis who operate the many t-shirt and beachware shops along the main drag, and of course the ubiquitious electronics store is Israeli-owned, too. Catering primarily to tourists (mostly French Canadians, Mainers, and people from Massachusetts), the concessions and stores are only open during “the season” (aka the summer months). But before I could even think of attending the Shabbaton, I had to find a place to board my dog. Here in rural Maine, most dogs are working dogs. 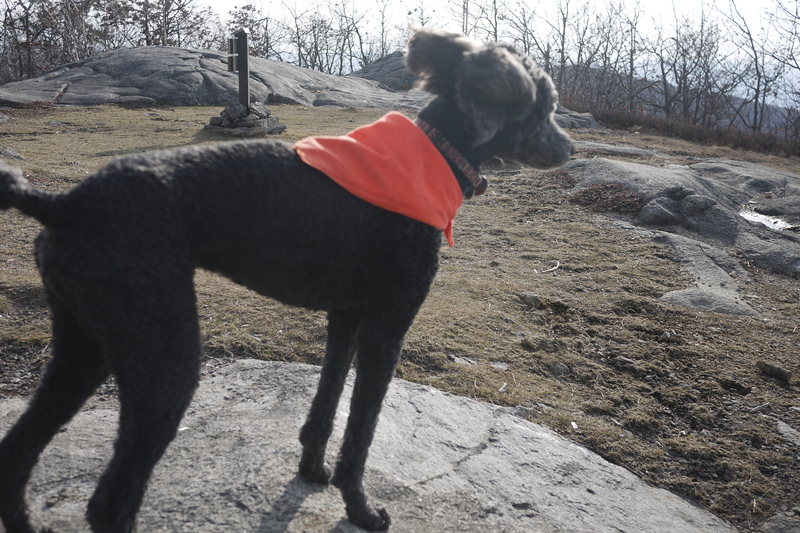 They may guard a farm or home; herd sheep; retrieve ducks shot in marshes and bogs during hunting season; track and hunt down bears; be hitched to sleds and race during winter; scale mountains with their owners during hikes; aid in search and rescue in the mountains. Many rural dogs are left outside year round, sheltering in an outdoor kennel or cage insulated with straw. Few are “indoor” dogs living in the lap of luxury as mere accessories to their owners, with no expectations as to their worth other than as loyal companions offering unconditional love. There are plenty of kennels near where I live, but none were the right environment for my dog. Most of the kennels were extremely confined spaces; they didn’t allow for socialization with other dogs lest fighting occur (my dog loves to play); and most kennel owners showed up only to fill the dogs’ bowls with food and water and to let them out to go to the bathroom. Otherwise there was no human contact nor interaction. Finally I found a place that was “cage free.” At the unfortunately named “Doggone Fun Doggy Daycare” all dogs interacted all of the time, playing together during the day in a huge grassy fenced area and sleeping together in a converted garage (connected to the owner’s home) that was filled with old couches and cots. However, since the dogs had constant interaction, it was necessary for them to get along, as not all dogs interact happily. So the kennel required my bringing my dog sometime before (a 90 minute drive one way!) for a 1-hour “evaluation” to make sure his social skills were up to snuff. You’d think he was trying to get into Harvard. As bad as this sounds, apparently I am not as neurotic as most dog owners. I did not feel a need to check on the live webcam the kennel posts 24/7 to make sure my dog was faring well. 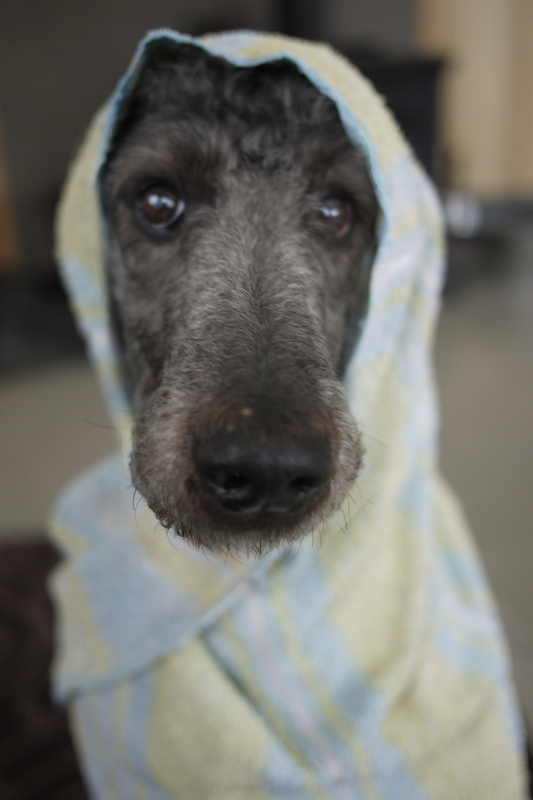 Nor did I wish to become a Facebook friend so I could watch the numerous videos and photos of the doggie boarders the kennel owner posts throughout the day. Fortunately his rates were fair, unlike another kennel I checked out whose rates were higher than the motel we booked in Old Orchard Beach. I was not about to pay more for my dog’s accommodations than my own! Now that the dog was taken care of, I could concentrate on the Shabbaton. With great apprehension, we arrived at the motel, about a 2-hour southerly drive from our house. It did seem rather run-down from the outside, but the staff was accommodating when I asked to look at the room first before committing. 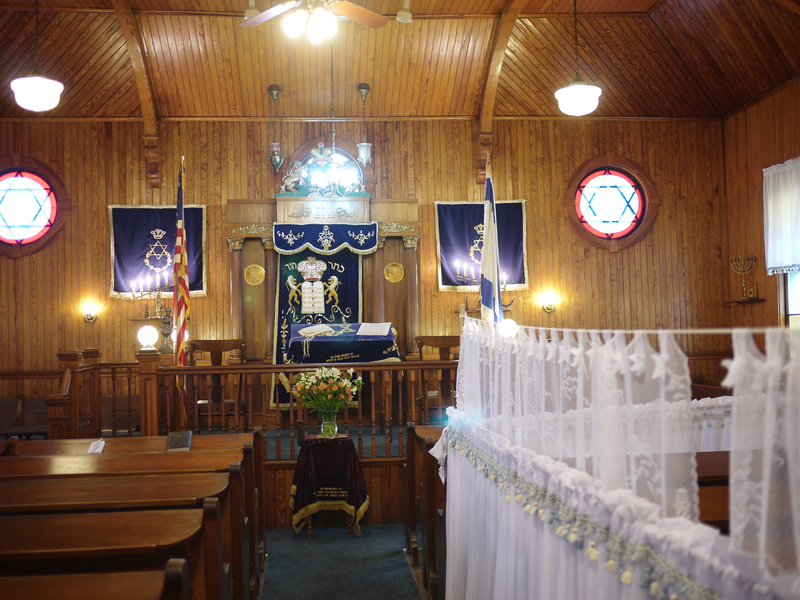 With only an hour remaining before the beginning of Shabbat, I ran to the shul and took some pictures of the interior and exterior, as well as the beach that was literally in the shul’s backyard. 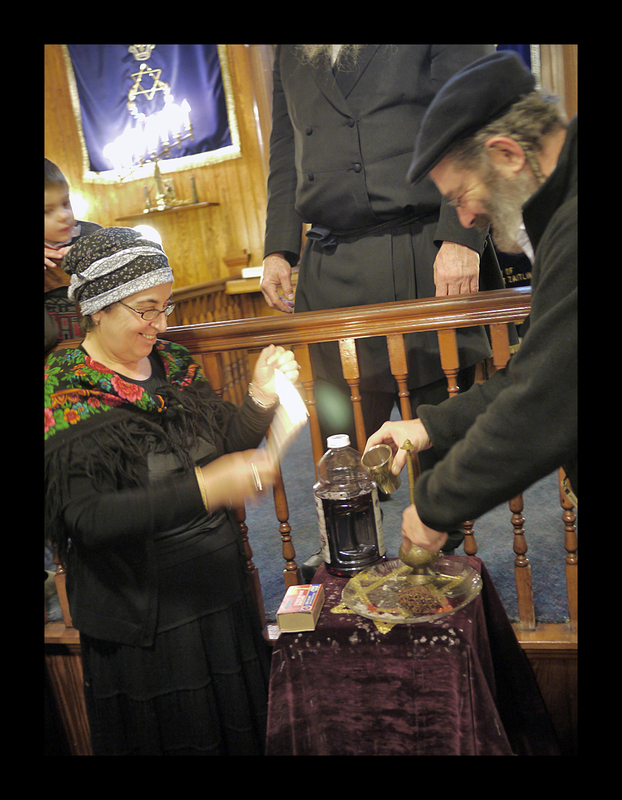 I ran back to the motel, stashed my camera, and walked back to the shul with my husband, where I lit candles and he davened with the minyan. 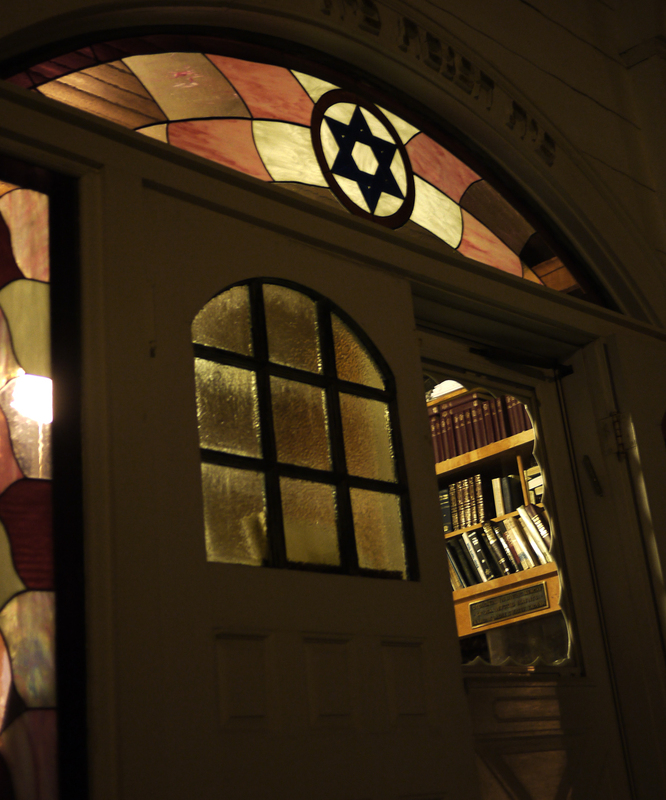 I lit candles two doors away, at the restaurant where we’d be having our Shabbat meals. 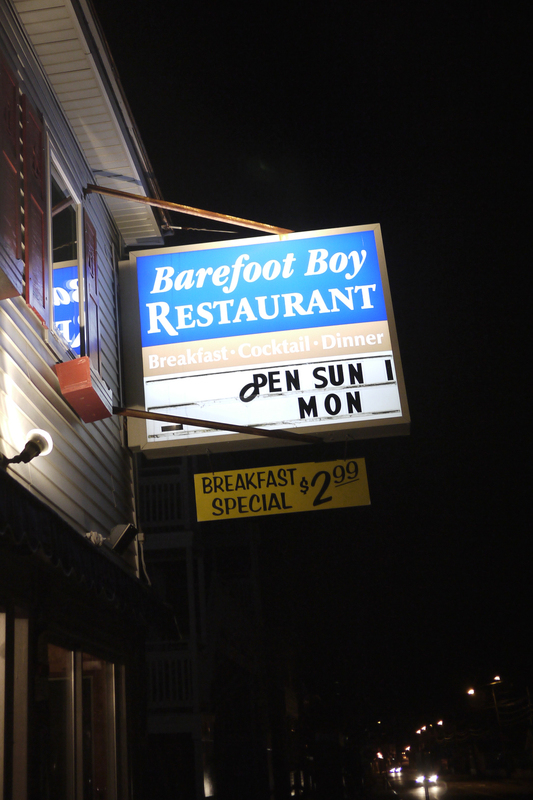 The Barefoot Boy was built several decades ago by the brother of our Old Orchard Beach Shabbaton organizer and hosts, the Weinsteins. A few years ago he sold it to an Italian guy with whom the Weinsteins maintain a good relationship. 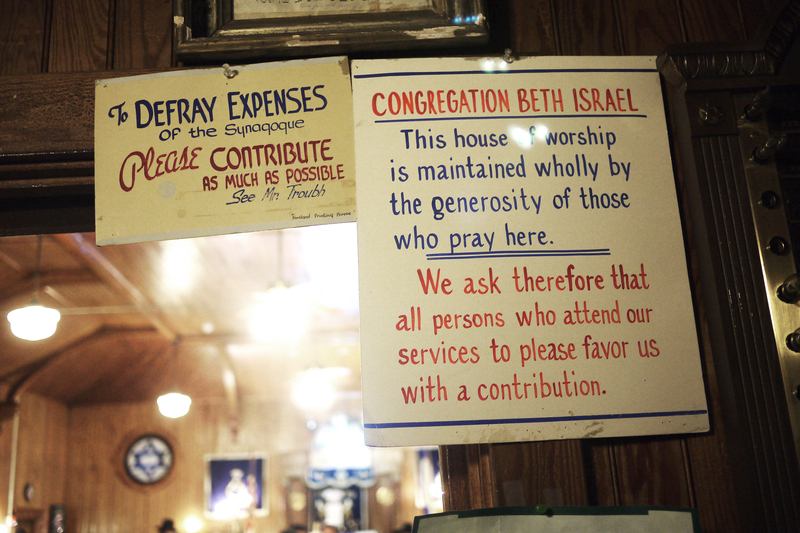 Due to the restaurant’s proximity to the shul, and the fact that the restaurant is now open only on Sundays due to the off-season, the owner was amenable to hosting the meals, catered by the Chabad rebbetzin from Portand, for the Shabbaton. Imagine: delicious kosher Shabbos meals . . . in a lobster restaurant! 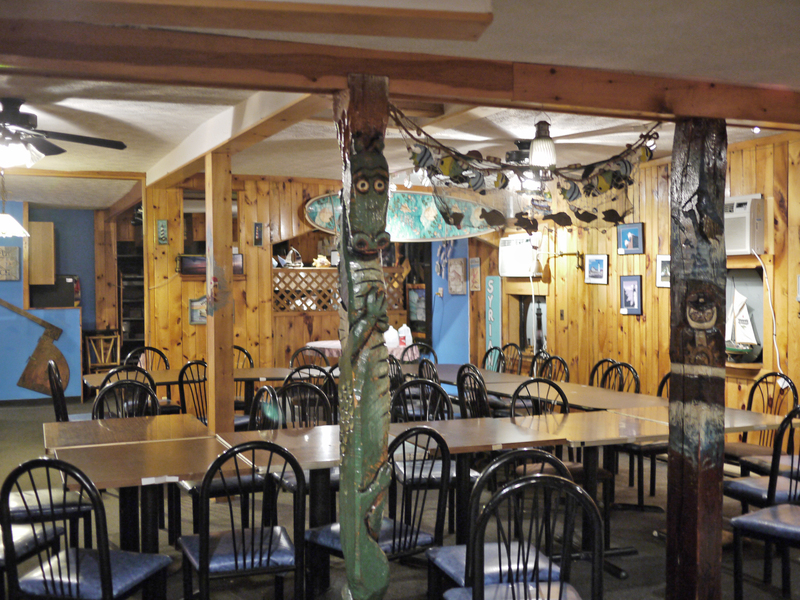 This lobster restaurant is where we lit Shabbat candles and ate our meals. 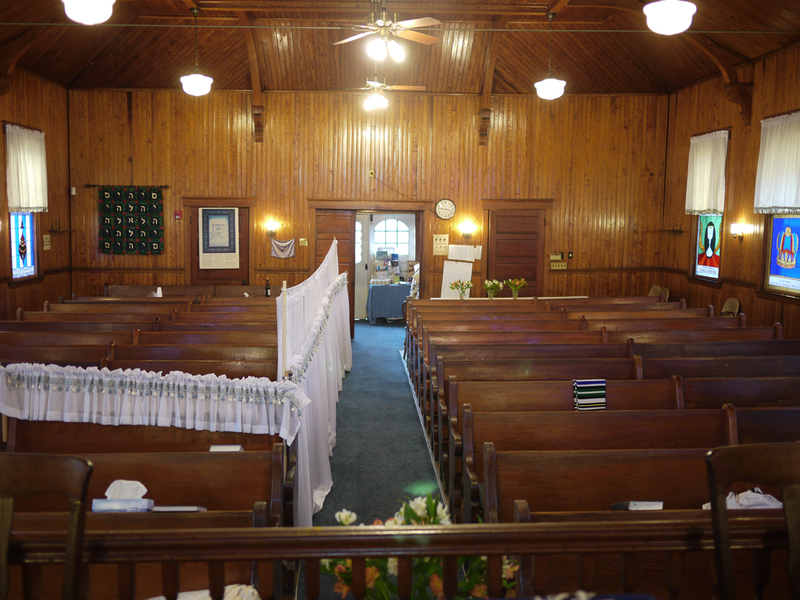 At that time the tables were decorated with white Shabbos tablecloths and bouquets of fresh flowers. Although it was kind of strange to be eating amongst fishnets and mermaid and lobster decorations, most of the main street was shuttered for the season with no tourists about, so I don't think there was an issue of mar'as ayin. 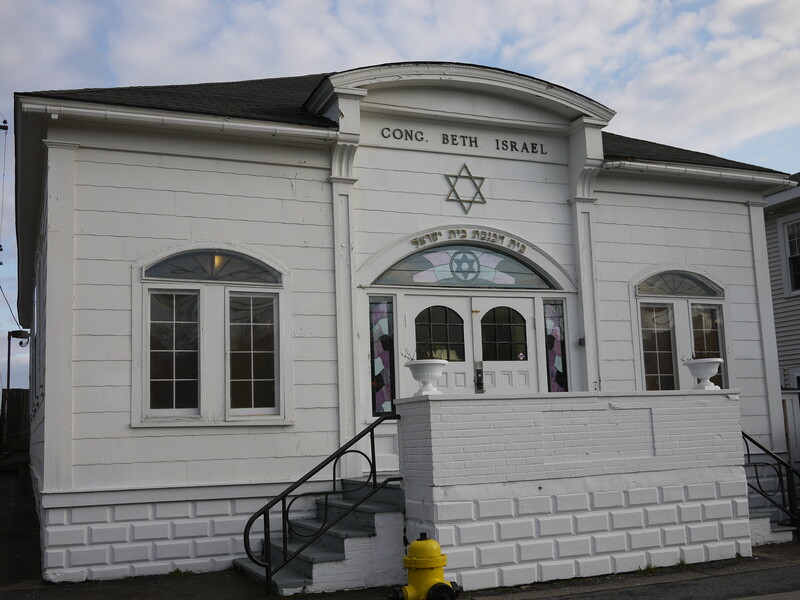 Although the shul remains open every Shabbos throughout the year, it was the first time that Congregation Beth Israel had a minyan since the summer season, so worshippers were greeted with extreme joy and appreciation. It was an eclectic mix of people, ages 3 to 69: five people from Old Orchard Beach, a family of three from Portland, and my husband and I made up the Maine contingent. The other 25 or so people came from the Boston-Newton area (one family via Russia). Just about everyone there was a ba’al tshuva, including the featured speaker, an American rabbi now living in Israel who studies the writings of Reb Nachman of Breslov. Due to the intimacy of the environment, we quickly established a kesher (ties) with many of the participants. In fact we shmoozed so long over lunch that there wasn’t time to return to the motel before mincha, so the participants continued their shmoozing on the sunny but very brisk beachfront. I am hopeful we will soon be having many new Shabbos visitors to our house in Maine! After mincha I returned to the motel and as soon as Shabbos was over, I said Baruch HaMavdil bein kodesh la’chol. 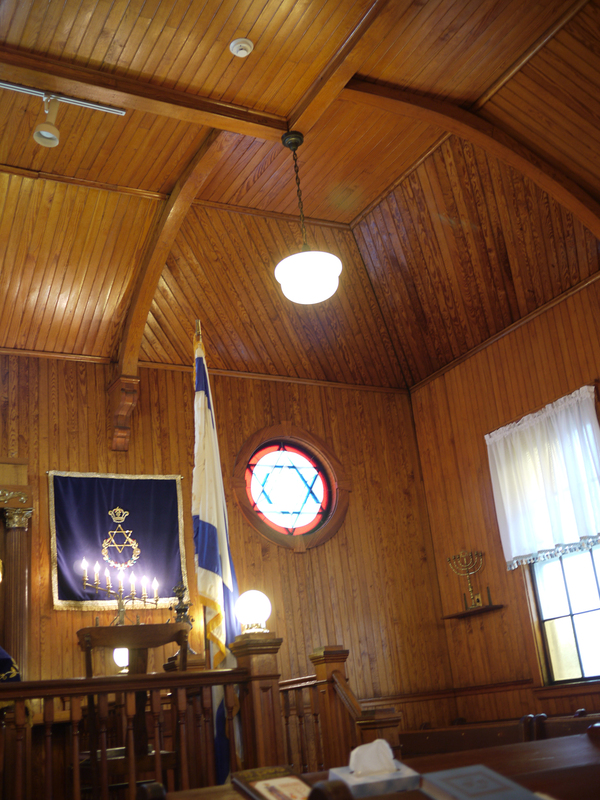 I drove my car to the shul, camera in hand, for havdalah. 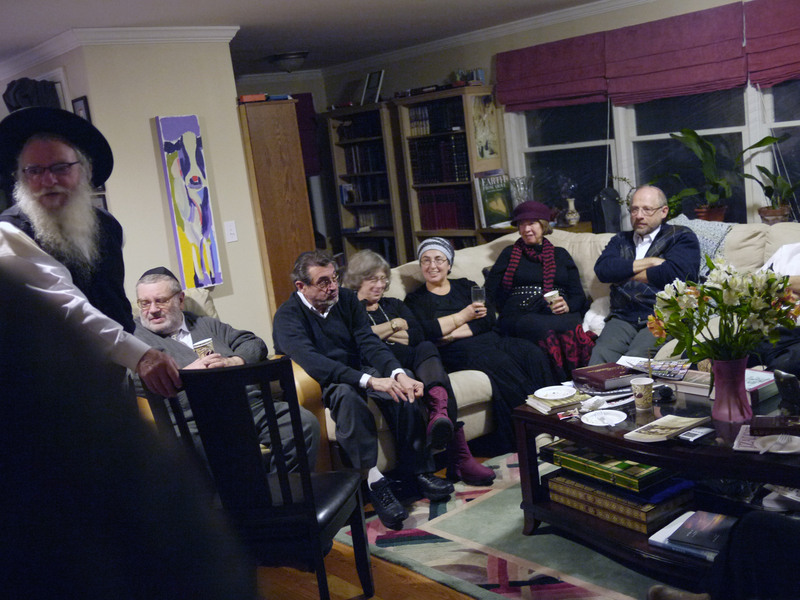 On motzei Shabbos all of us went to the Weinsteins for a Melave Malka for discussion, camaraderie, and more food. 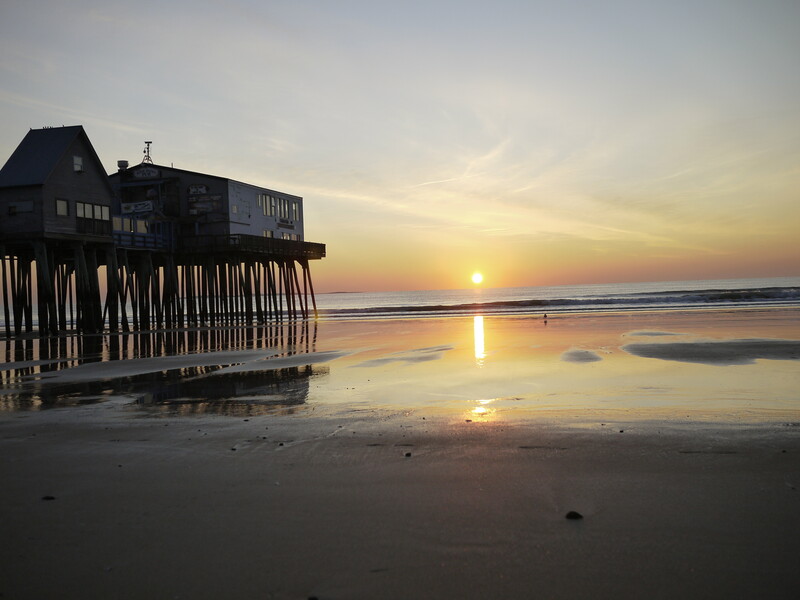 On Sunday morning I dashed to the beach in time for a sunrise photo. I was thrilled to find sand dollars at low tide, which brought back fond memories from my childhood, when we used to collect sand dollars, clamshells, abalone shells and conch shells on the beaches in Santa Monica and Malibu (in the 1960s there were actually shells on the beach, which is no longer the case). 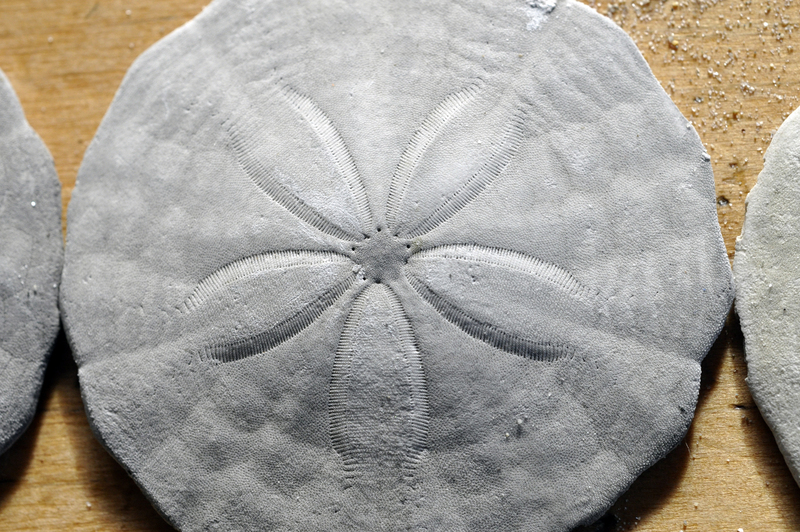 I put the sand dollars in my pockets, with the idea of sending them to my grandchildren. 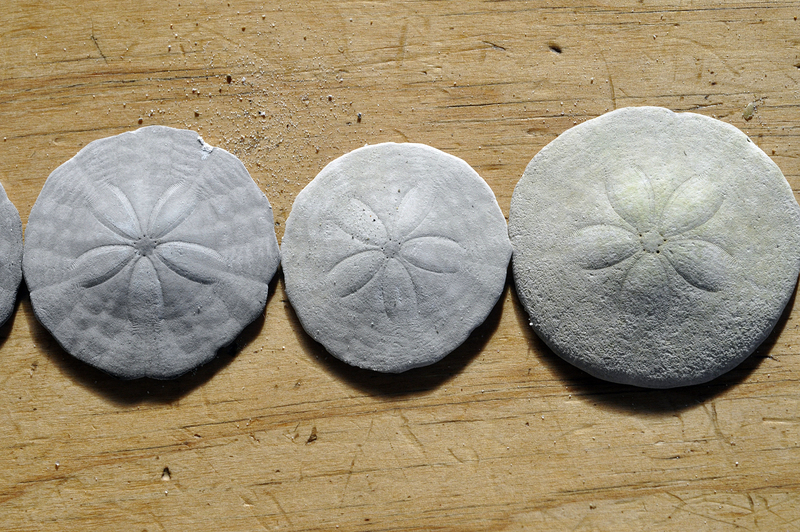 Sand dollars are really quite amazing works of art: HaShem has stamped each with a perfectly engraved daisy. The Shabbaton concluded Sunday morning with davening, brunch and a shiur. We said our goodbyes and exchanged email addresses. I headed north, back to our house in Maine, first picking up our dog at the kennel, who survived his stay at Doggone Fun Doggy Daycare without incident. Was there ever a greater way to stay in touch with our grandchildren when we can’t be with them, than Skype? . . . 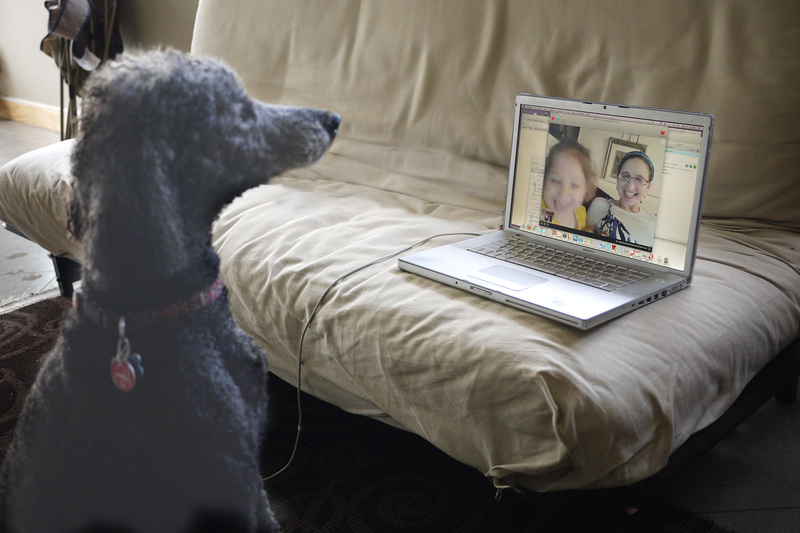 Although I think my 3 year old granddaughter in Israel prefers “Skype-ing” with our dog, Spencer . . . 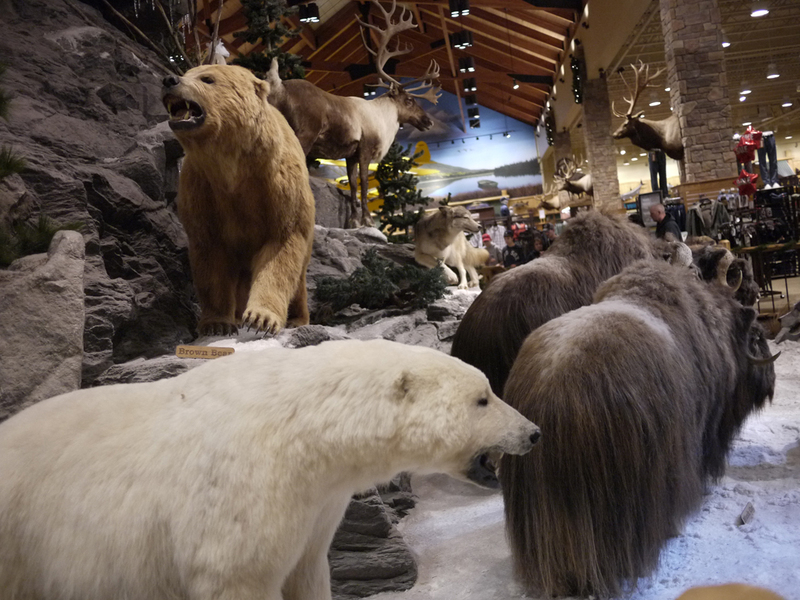 While big-box sporting goods stores exist throughout the US, there is something special about Cabelas. 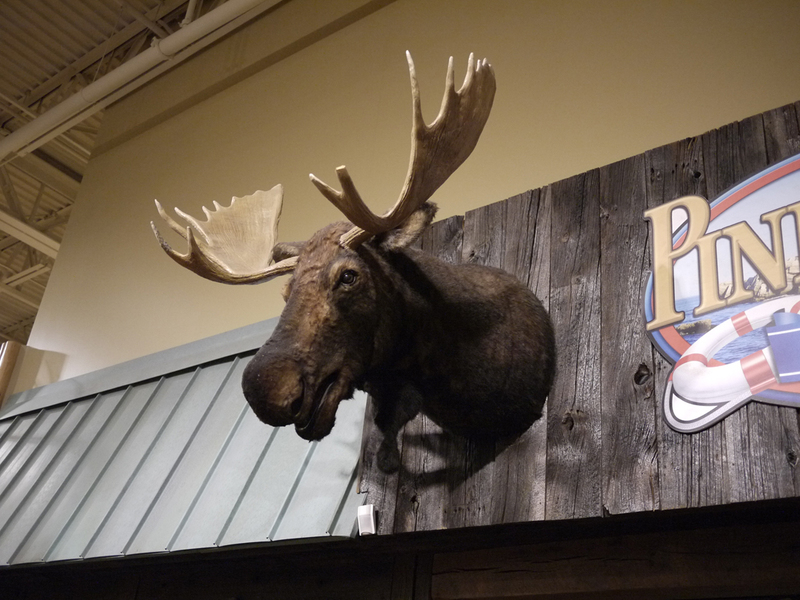 So when I saw a Cabela’s just off the highway when we were on our way to Old Orchard Beach, I knew I must somehow find time to stop in. 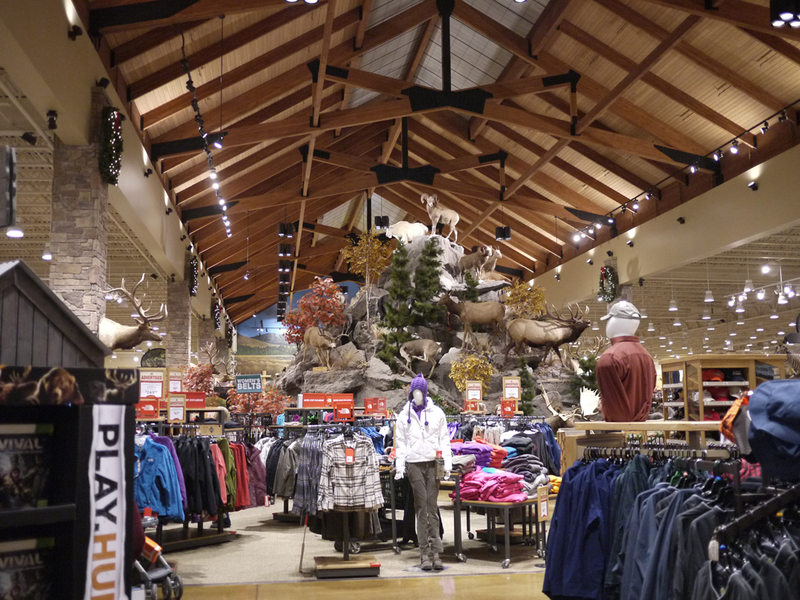 It was only an hour before closing when I arrived on motzei Shabbos, but Cabela’s was booming, despite the mostly higher-end retail prices. 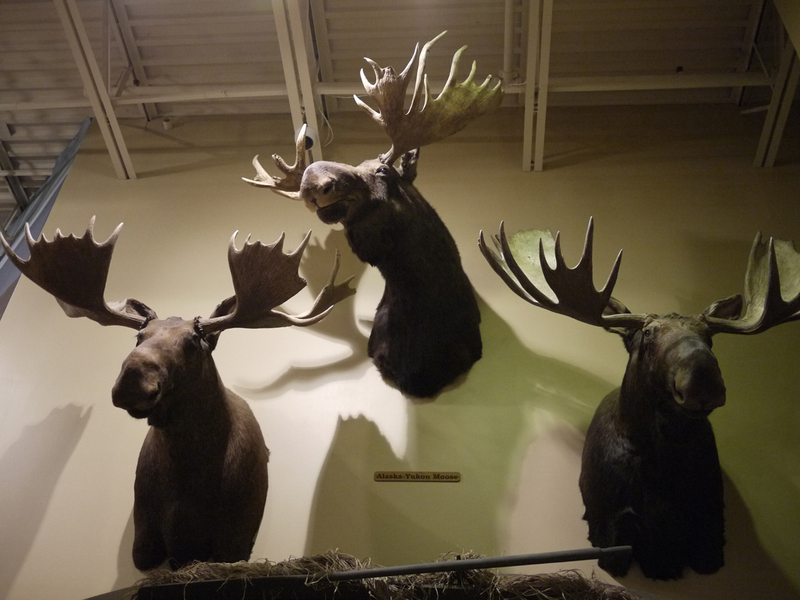 Whole families toured its boundless aisles filled with anything and everything having to do with outdoor recreation (biking, camping, kayaking, hiking), target shooting, hunting and fishing; clothing related to those activities; home decor (as long as the “home” is a log cabin or lodge, since everything has a woods theme with lots of canoes, moose, and bears incorporated in the design), and food preparation and preservation (food dehydrators and camp stoves and anything to do with beef jerky). 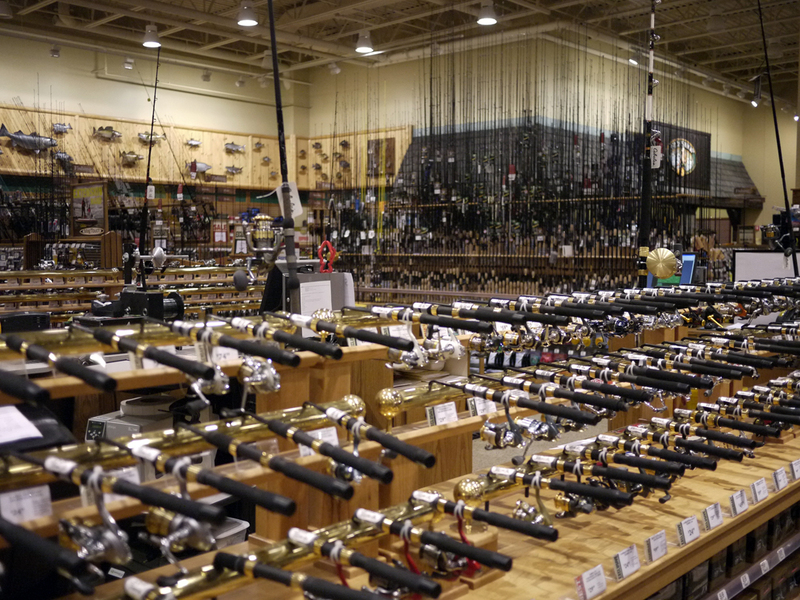 This vast collection of rods and reels for sale captures only about 25% of the actual display of fishing equipment, which besides yet more rods and reels and other fishing paraphernalia, includes hundreds of taxidermied fish species displayed on the walls and a giant aquarium filled with many varieties of live fish. 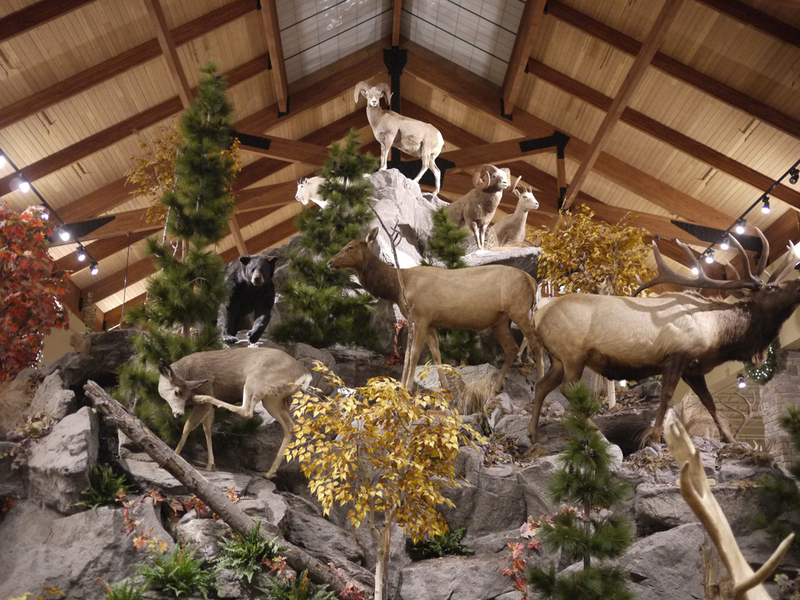 There are literally hundreds of magnificent examples of taxidermied animals from around the world displayed throughout the store. There is a group of gazelles frozen in time, “running”in flight; a deer scratching itself; and other such “natural” and “action” poses that are amazingly lifelike. 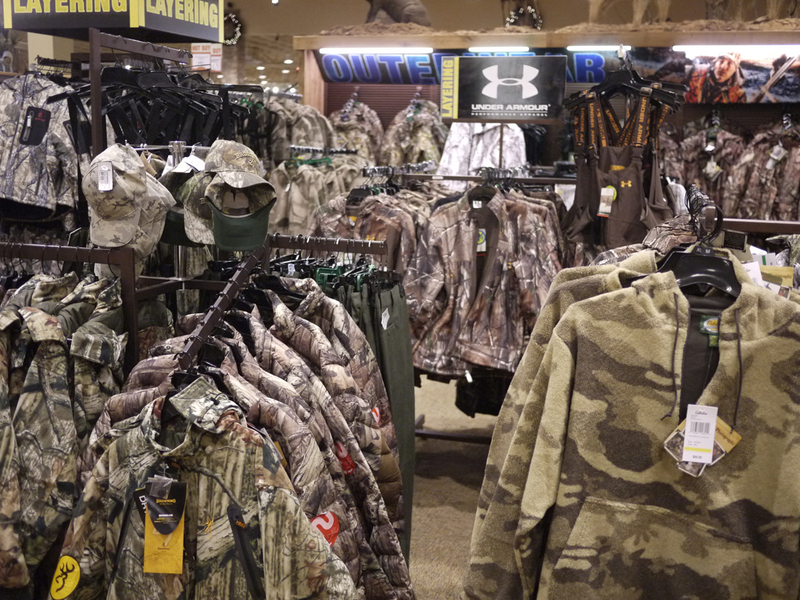 It’s actually kind of sad to think of all those animals that were killed for sport. 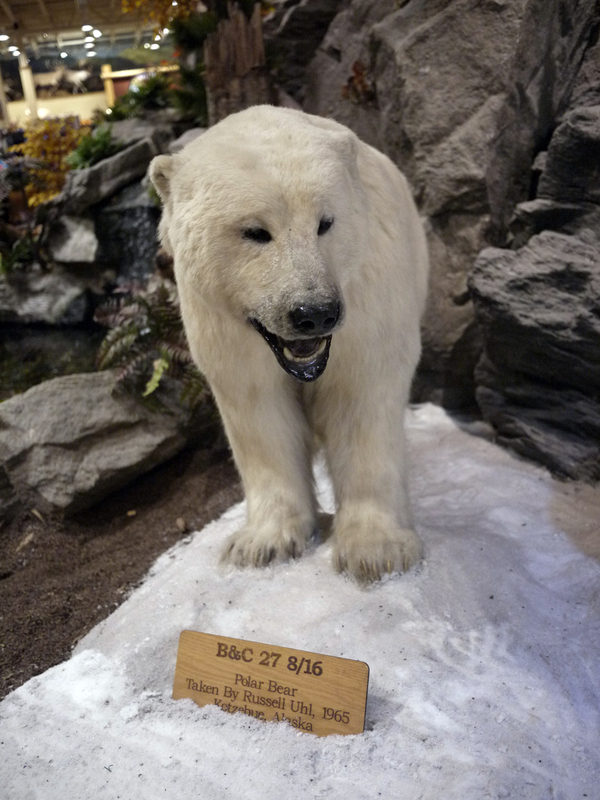 Many of the animals on display are now on the endangered species list (although that was not the case at the time of their being shot). Big game hunting for sport has little in common with local deer hunting, which in many cases keeps hunters and their families from going hungry in the winter, when jobs are scarce. 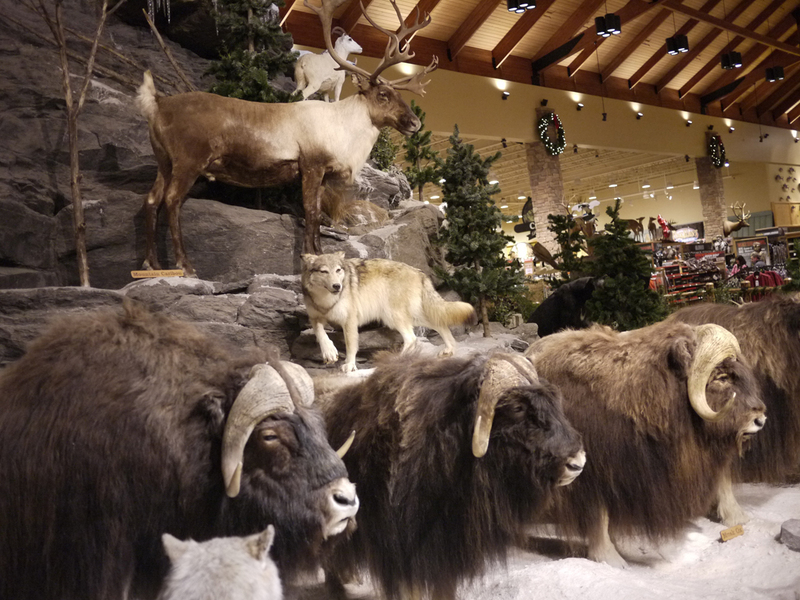 At the store entrance behind a clothing display is a rock cliff which has a 360 degree display of taxidermied big game animals.